Many thanks to Clive Bates, Sharon Cox, Charles Hamshaw-Thomas, Nancy Sutthoff, David Sweanor and Terry Walker for taking the time to write these fascinating accounts. First, the science programme was a significant upgrade on previous years (I think Linda Bauld might have been behind that) and it was great to hear from the top American experts in the field, like Eric Donny and Neal Benowitz, and to have some dissonant views in the room. Benowitz suggested nicotine may cause COPD… who knew? Second, I think the extra courage in having industry speakers was well worth the risk of someone taking offence and flouncing out – no-one did. The more we can understand what they are thinking and what drives them the better. All the tobacco industry participants that I saw (Ian Jones, David O’Reilly, Moira Gilchrist, and Cecilia Kindstrand-Isaksson) gave really thoughtful presentations and I for one left much the wiser for it. I really can’t believe it is so hard for so many to talk to these people, they were really constructive addition to the agenda. Talking after years of unconditional, unyielding conflict feels right given the changes in the market. Third, some bloody inspiring speakers. I’ll have a pint of whatever powers Ethan Nadelmann please! Being a sad old cynic, I am rarely moved by much these days, but Helen Redmond on smoking among the very poor, mentally ill and otherwise highly disadvantaged had me welling up. If there is a reason to spend night and day on these issues fighting off the lunatics in tobacco control, Helen made the case powerfully and passionately. Fourth, OMG the social life! I did at least have three hours sleep before my presentation this year (an increase of three hours from last year), but I had so many good conversations with many old mates and many new ones. Great to talk to Roberto Sussman a physicist, philosopher and vaper from Mexico – I’m hoping this will lead to him guest blogging on ‘Counterfactual’. Great to do more plotting with American comrades and to workshop our assault on fortress FDA. So much to say, so much unsaid, but what a great event! Conferences are always an exciting time for early career researchers. They offer the opportunity to meet with more senior academics and network with fellow researchers, who presumably, you’re going to be spending a lot of time with over the next few decades. Most importantly, for me, is the chance to hear from leading academics in my field about their work – in their own words – without the constraints and input from peer-reviewers. This was my second year at GFN. For researchers interested in nicotine, reduced harm products, smoking and all the rest, it represents one of the ‘go-to’ conferences. Consumers, advocates, policy makers, academics (like me), and product developers, are all given a fair hearing – which is unique. The last year has seen some of the most progressive developments in e-cigarettes and other reduced harm products, the launch of PMI’s IQOS being one. The other has been Dr Lion Shahab’s (and colleagues’) research findings on long-term exclusive use of e-cigarettes compared to NRT, smoking and dual-use. For many, this was the paper that had been long-awaited, especially amongst scientists and health professionals. Lion’s presentation was one of this year’s highlights. The importance of this research cannot be underestimated; a constant concern among the health profession and the general population has been “but what are the long-term effects?” This question has now started to be answered. I felt particularly proud to be part of a British team of researchers at GFN, amongst such fantastic and hard-working colleagues, answering difficult and controversial questions. Professor Linda Bauld presented an update of advice on using e-cigarettes in pregnancy, and highlighted new literature available on the subject which has now been translated to over 20 languages. Dr Richard Holliday also brought to our attention that it is front line health professionals who still need to be convinced – he gave us a unique perspective from dentists – which I’ll admit I hadn’t considered in this plight. But of course it makes sense that we need the dental profession on board – they see smokers as part of their daily routine. I had the privilege of summing up the science plenary. We heard from Professor Neal Benowitz, another highlight of mine. It’s important that the GFN continues to attract researchers from across the globe, with all different types of messages around nicotine. He always reminds us, that we need to do more, to understand more and be critical of the evidence. I think that formed my take home message. We live at a time when the principles of the Enlightenment are under attack. This is often most clearly seen in contemporary politics, but it is present in a seemingly ever-expanding range of issues. The rise of ideology and passions over reason, of pre-Enlightenment thinking, should concern us all. After all, the extraordinary gains in so many aspects of human life over the past few generations have been truly exceptional, and we owe such gains to reason; a willingness to engage in debate, focus on facts, respect individual rights and apply pragmatism. Dealing with the pandemic of smoking related illnesses should be straightforward. As Professor Michael Russell informed us in the 1970s, ‘people smoke for the nicotine but die from the tar’. Cigarettes are simply a very deadly nicotine delivery system, and if we could focus on getting rid of combustion we could largely, and easily, solve one of our greatest global public health challenges. But as with other aspects of modern life, such rationality is challenged by ideologies and ‘gut feelings’ that have long delayed such a breakthrough. The GfN has come to be a beacon for those one might call pragmatic revolutionaries. It is a chance for those from a very wide range of backgrounds but a shared interest in rationally applying a harm reduction approach to the realm of nicotine. There are differing views on a wide range of relevant issues, but an admirable willingness of hundreds of people from dozens of countries and a myriad of life experiences to come together to find ways forward; to apply the principles on the Enlightenment on an issue very much in need of it. The GfN has a huge advantage over the other tobacco and nicotine conferences I have attended through my long career in battling smoking in that it includes many consumers and consumer groups. Their voice is an essential part of any public health effort, and they invariably teach the rest of us valuable lessons. Having had the privilege of chairing these last two GfNs I have been given a great vantage point from which to observe the rapid changes in both thinking and technology as we confront the very real opportunity to achieve a public health breakthrough of historic significance. We can see, and be deeply frustrated by, the efforts to stymie the ability of smokers to switch to dramatically less hazardous alternatives; efforts that invariably protect the cigarette trade rather than public health. We can be dismayed at the widescale funding of research and advocacy that fails to pass any test of impartiality or rationality. But we also see the gathering momentum for change; the consumers becoming ever more mobilised, the entrepreneurs bringing forward new products, the regulators seizing the opportunity to make a fundamentally positive impact on people’s lives. There is a revolution afoot, it has the potential to prevent the forecasted billion smoking-caused deaths in the next century, and the GfN allows us to see it unfolding in real time. It is an opportunity I have never missed. An Imminent Outbreak of Common Sense? There was widespread comment, recognition and consensus that vaping products are – as Public Health England first identified in August 2015 – both exponentially less harmful than cigarettes and that they are playing (and can continue to) an important role in helping those smokers who are either unable or unwilling to stop smoking. 1.5m UK vapers describe themselves as ex-smokers. This equates (average daily consumption = 14 cigarettes) to a whopping 7 billion less cigarettes being smoked [note to Ed: at £74k (NHS estimate of monetary value of every ex-smoker) = +£100bn saving for HMG’s coffers?!]. There was also widespread comment, recognition and consensus that there has been a failure in the public health message regarding the benefits of vaping when compared to smoking. In 2017, fewer people in the UK are aware of the cavernous difference between the risks of vaping and smoking than were in 2012 (prior to publication of the PHE report). The situation is repeated across Europe and in other countries around the globe. Ron Borland (Cancer Council Australia) labelled the situation as ‘disastrous’ and declared a commitment to ‘dispelling the myths’ being perpetuated by others. Deborah Arnott and Martin Dockrell similarly acknowledged the problem in the UK and their determination to start changing the huge public mis-understanding. While the UK public health, scientific and tobacco control communities have played a leadership role in promulgating the principles of Harm Reduction and their application to Tobacco and Smoking (and in which the GFN so well organised by Gerry Stimson and Paddy Costall has played no small part), this year in Warsaw there were representatives from vaping and other new nicotine businesses, scientists, public health and tobacco control experts and legions of vaping consumer advocates from across the globe. Tobacco Harm Reduction is quite evidently ‘going global’. For anyone with a scintilla of interest in Reducing Harm, Saving Lives from the damage to public health caused by Smoking the address from Ethan Nadelmann is A MUST. It got the GFN off to a flyer and from then on there were a number of excellent presentations and discussions. My particular highlights were Sharon Cox’s clarion call, or was it a demand(?! ), for clear public health information that can enable all smokers to make informed choices; and Louise Ross’s call, which followed Chair David Sweanor’s opening remarks that ‘.. we’re all in this together.. ’, for self-interest and separate agendas to be cast aside; surely we all enjoyed Louise’s words ……. ‘.. we must stop p****** on each other’s chips.. ’?! The public health prize offered by ‘new nicotine’ is huge. The prize for businesses (such as Nicopure Labs) is similarly huge – smokers still spend over US$700bn each year across the globe. My hope is that GFN 2017 can be regarded as the moment when some understanding of respective interests began to emerge ……… there was an outbreak of common sense. Thank you Gerry and Paddy and all your team! For me, the highlight of the proceedings was my introduction to and chat with Hon Lik, whom I consider my saviour in that his invention has improved not only my quality of life, but also its length. I found Hon to be an unassuming and likable chap whose parting words were “I believe that you will be the first vaper to reach the age of 100 years.” During our photo- op, after the obligatory hand shake, one of the photographers said “they should be vaping together” so amongst much hilarity we both withdrew our personal devices and proceeded to vape. I was somewhat disconcerted to find that his was three times the length of mine, a fact that provoked much laughter.. Many of the delegates must have read the Journey to Vaping blog, as so many of them came up and shook my hand saying how much they had enjoyed my vaping journey. I understand that the conference was attended by some 320 delegates drawn from over 50 countries, ranging from the USA, through Europe and onto Australia & New Zealand. Altogether a good turnout I thought. The Forum title – Reducing Harm-Saving Lives was excellent, putting so much meaning into so few words. The presenters were an eclectic mix drawn from all walks of life from learned scientific professors through policy makers to committed vapers. Of course Big Tobacco, with their huge leaf reserves was well represented showing us many charts & graphs with which to demonstrate that their heat- not burn products were orders of magnitude safer than normal cigarettes. I am sure they are, but the devices seem over engineered, complicated and presumably more costly, when compared to a cig-alike product. Personally I would never use any product containing raw tobacco ever again. That does not mean I would wish to ban them, as I am a great believer in choice. Clive Bates presentation was simple and to the point when viewed against the latest figures on smoking statistics which show that the number of smokers has now dropped below 16% for the first time. I remember in the 1980s when acting as a Health & Safety rep I carried out a survey on smoking and found 83% of our people smoked! However we must brace ourselves, ready to accept regulation, certainly if my feelings are correct that e-cigs will be on NHS prescription within the next six years. One big problem I see with prescription will be the costs involved in gaining the “medical approval” required. I envisage huge costs to be involved which may force smaller producers out of the running, whilst Big Tobacco will have no problem in funding such activities thus gaining an advantage. Regarding the Snus presentations, this was all new to me. I believe I was vaguely aware of it but find it hard to believe that this type of tobacco usage would be attractive enough to cause a smoker to change his habit. I did try my Dads snuff as a youngster but found it unattractive as I found no pleasure, – only sneezing. The Swedish statistics on tobacco usage, number of smokers, and death rates are quite remarkable. For me, and I feel many delegates, the final day gave us a most powerful presentation from Helen Redmond. Whilst many of the technical papers with charts and graphs seemed to go over our heads, due to the short time allotted on screen, Helens paper struck home to the heart and received the greatest ovation. 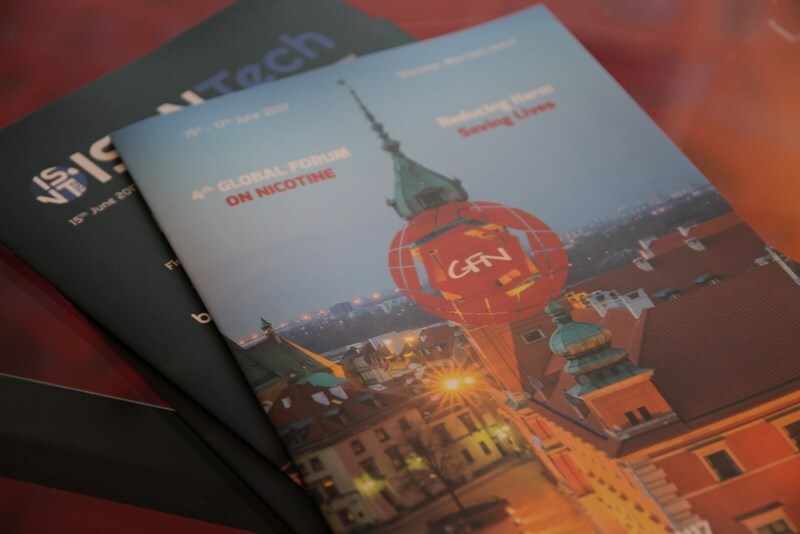 GFN17 was an experience I am so glad to have taken part in. The concept of Harm Reduction: Saving Lives is what AVCA is all about – one person at a time. This year, I found the “vibe” to be much more inclusive and collaborative between all the attendees without the usual “battle lines” drawn between advocates, public health and manufacturers, which was not only refreshing but also confirmation that we at AVCA, who work with ALL stakeholders, are indeed on the right track with our advocacy and our plans for the future. It was a personal highlight for me to meet again, after 30 odd years, with Ethan Nadelmann, who has always been an inspiration to me with his passion and dedication to advocating for and helping others, providing them with a passionate voice. I had volunteered back in the 1980s at the GMHC in NYC during the height of the HiV/aids crisis when he was also heavily involved in the programs there. Proving that wherever you go, there you are. I was also humbled to present to the conference what we do at AVCA, as well as explaining how we do it, and why. I hope that I was able to convey the scope and passion we have towards our advocacy and harm reduction and perhaps inspire someone as I have been inspired by others at both last years and this years GFN. That is what I think is most important for consumer advocates who are able to attend the GFN – the ability to talk to other people who do what you do, and get feedback, confirmation, support and guidance. It makes our practice that much more effective and our work that much more valuable. It is never about any one individual, but about the whole. We are all part of the whole and the GFN reminds us of that, and makes us more united and stronger as a unit.